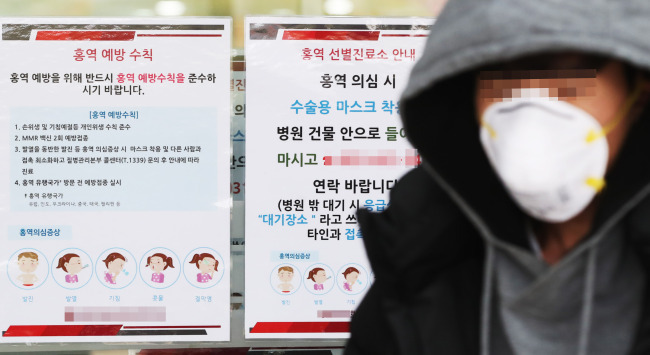 A measles outbreak has struck at least 31 people in South Korea in the past month, and is likely to continue. The latest confirmed cases were in Ansan in Gyeonggi Province, Seoul and South Jeolla Province, with earlier cases confirmed in Daegu as well as North Gyeongsang and Gyeonggi provinces. Of the 31 people who have contracted measles, 16 are infants and children aged 4 or younger. The rest are medical workers or parents of children with measles and are in their 20s and 30s. The highly contagious disease is likely to have come in from abroad. According to the World Health Organization, the US and Europe have each seen more than 100 cases of measles, while over 1,000 cases each were reported in Thailand and Malaysia. The Philippines has seen some 4,000 new confirmed cases in the past month. WHO listed Korea as having eradicated measles in 2014, which means that no one was infected with a homegrown strain. In 2014, about 400 people were infected with a strain from overseas. The first sign of measles is usually a high fever, which begins about 10 to 12 days after exposure to the virus and lasts four to seven days, according to WHO. A runny nose, a cough, red and watery eyes, and small white spots inside the cheeks can develop in the initial stage. After several days a rash erupts, usually on the face and the upper part of the neck, and eventually spreads to the hands and feet. The Korea Centers for Disease Control and Prevention advise those who haven’t been vaccinated to get vaccinations. People who have been tested for measles are advised to separate themselves from others until the results come out in a day or two. Measles infections can be avoided for life with just two MMR vaccine shots, one between 12 and 15 months of age and another between 4 and 6 years old. Parents of unvaccinated infants younger than 12 months or children below age 6 who have not yet received a second dose can consult doctors about early vaccinations. People born between 1983 and 1996 who received only one dose of the measles vaccine are required to get a second dose before traveling abroad.